Dolpo lies in the far western hilly region of Nepal. This is one of the most remote districts of the country. 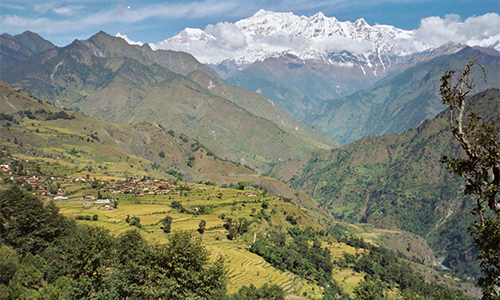 It lies in the shade of the Dhaulagiri range; the tribes living in this area mostly follow the Tibetan culture. We start walking from Darbang. During the trekking, we cross at least 7 high passes. We’ll pass fantastic areas in the heart of Nepal and we’ll come to appreciate the landscape of the country, but also just how remote a region Dolpo is. The people we’ll meet are truly Nepali as they have very little contact with the outside world, and their Tibetan culture is truly preserved. We begin the journey to Dolpo with a bus to Pokhara. Then we drive to Darbang through Beni next day and camp in the bank of a river. Then our Walking begins from Darbang through mid-Nepalese hills. Beautiful small villages, rice fields, banana trees, and many flowers set the scene in this tropical environment. By forest-covered slopes, we ascend the Jalja La (3435 meters), the first pass on this trip. In the plains of Dhorpatan (2880 meters) live many Tibetans who escaped into Nepal in 1959. Trekking in this region includes witnessing the high Himalayan valleys, which resemble the Tibetan highlands. The major highlight of this trek, which is specially organized by Himalayan Vacation Treks and Expedition, includes “Shey Phoksundo National Park” which is the largest National Park in Nepal. “Shey Phoksundo Lake” is another site we won’t forget. As it’s totally free of aqua life, the waters are crystal clear. Surrounded by rock, forests, and snow-capped peaks, this area is described as one of the World’s “Natural Hidden Wonders”. This day we travel for 6-7 hours if we are going the bus. But if we are going by air it will take just 35min to fly from Kathmandu to Pokhara. Immediately after we left Kathmandu you climb to the pass over the mountain ridge that surrounds Kathmandu valley. If it is a clear day, we can enjoy the phenomenal view of Ganesh Himal, Lamjung Himal, Manaslu and Annapurna on the way. The road descends to about 400 meters and runs along the Trishuli River. Sometimes we can see a group of people in rafts in the Trisuli River. The bus stops for lunch on the way. Finally, we reach Pokhara the most beautiful city of Nepal by the afternoon. From today onwards, after the dinner or before we go to bed, the Himalayan Vacation Treks and Expedition trekking guide will take a report and give a briefing in every evening about the trek that we are going to make next day. We drive to Beni by bus then from Beni, we take a local jeep to Darbang for about 3 hours. We stay in Darbang for the acclimatization although we have enough time. We walk to the first beautiful mountain village of this route, Dharapani. We walk upstream along the beautiful river Myagdi Khola. In the afternoon we arrive at our first campsite. Here we walk through the hilly region that lies between the low land of the south, Terai and high Himalayan mountain of North. We walk through fertile valleys and big villages with beautifully decorated houses where the tribes like Gurung and Magars, the most original people of Nepal reside. We stop at Darbang (1180m) where our cooks will be waiting for us for lunch. After Darbang we cross the Myagdi Khola on the west bank. After about an hour’s climbing from the altitude of 1470 meters, we get a glance of a big mountain village Dharapani, from where we can see the southern walls of a large part of the Dhaulagiri- range, including Dhaulagiri I and III and Churen Himal. We will camp at Dharapani for the night. The view of Gurja Himal is magnificent from here. In the beginning, the route goes uphill up to 1730 meters then we walk through another big village Takum. Takum is the village where Magars, Gurungs, Kami/Damai so-called low castes and other tribes of Nepal live in peace and harmony. This is a village with health post from where the local people get their general health services. Shops where handlooms produced by the local people are available here. We see the local farmers growing millet, sorghum, papaya, orange etc in this region. 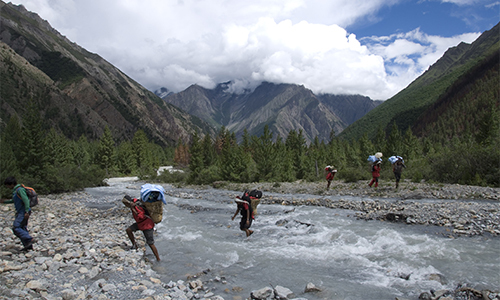 We cross the Phaliya Gaun and reach the camp at Muna which is a big village in the Himalayan region. The tribes found over here are just like the tribes living in Takum. We can meet the hard-working local people and know about their lifestyle in the village. These simple people love to talk to you welcoming you with smile and Namaste. From Phaliya Gaon we leave the “Around Dhaulagiri” route here and catch the ‘main road’ to Dolpo. We follow the route to Muna, descend to the river and the river to stabbing then down the other side have to walk quite a distance to Lumsum where we overnight. We pass a beautiful waterfall (via the lower route). Their maturity is today between 6 and 6½ hours. We cross a village called Lamsung and slowly climb to the pass Jalja La which is the first pass of this route. We walk through the huge rhododendron forests and gradually go up and up to the top of the Jalja La which is a flat meadow with various pastures. We may get the luck to have panoramic views of the peaks of Dhaulagiri range and Gurja Himal. Weather becomes snowy from the autumn. After the pass, we slowly walk down to the camp at Patihalna Kharka. Today we cross a river Dhanche Marne Khola through a suspension bridge. Then we walk alongside of the Uttar Ganga River. We cross jungles and some small villages on the way. People live in those villages only in the summer, not in the winter. We see a monastery in Chhentung. Near the monastery is a school for Tibetan medicine. The route takes us to the plain of Dhorpatan, a wide valley where Tibetan refugees have settled. Here is the check post of the Dhorpatan Hunting Reserve. An airport has been constructed in Dhorpatan but no air service yet. 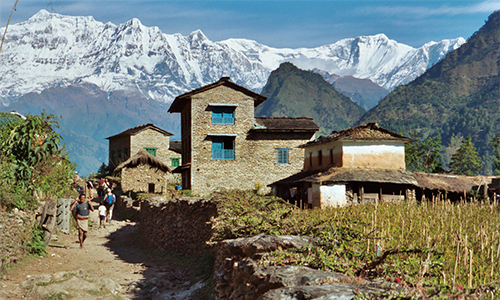 Dhorpatan is the last human settlement in this region. We camp at the Forest camp that lies in the north of Dhorpatatn. After the forest camp today we climb up to the pass called Phaguni Dhuri and which is 4000 meters. We view the barren land everywhere here. After the pass, we slowly walk down the steep route which sometimes may be covered with snow. We gradually walk down to Thankur Phedi enjoying the panoramic views of Himalayas. We walk fully steep downhill to the campsite which is located in the jungle on the banks of a small river. The campsite is in a lonely place just with a tea shop nearby. The route still goes downhill after Thankur Phedi. We walk through the forest with the trees that have mosses and orchids hanging and cross a wooden bridge over a stream called Ghustang Khola. Then we head to Pelma which is a small village where so-called low caste tribes reside here. We camp in Pelma. Local products; eggs, hens, green vegetables, alcohol, and wine are found here at a very good price. In the past, we could see the local people wearing house made garments often not washed for long due to severe cold. But now they are changed. They have a school in the village too. The route goes still downhill in the beginning. Then we cross a stream called Doagri Khola through a wooden bridge. The route goes quite uphill through the terraced fields. We cross a village called Yamakhar where the tribe called Magars reside. Local products; eggs, hens, green vegetables, wine, and alcohol are found here too just like in Pelma at a very good price. We walk through a stunning ravine. We slowly head to Dhule, our campsite where we see shepherds’ huts specially made for the rainy season. Hunters’ also camp also seen in this area. From Dhule, we walk the route through a jungle that goes straight about 400 meters very steep up for about one and half hours. We head to the pass, Nautale Bhanjyang (3970m). The route over here is dangerously steep. From the pass, we can see the Jalja-La in the southeast. Then we walk downhill along the Seng Khola, a river. We finally reach the camp which is situated at the Seng Khola. This spot is one of the coldest places on this trip. This area is of Yarsagumba, a precious natural drug that is found in this region. Today we are going to walk for about 4 hours only because we are walking in the high altitude and need to acclimatize slowly. The other reason is that the route goes straight uphill to the Purbang where we will camp. We have pack lunch today and rest in Purbang for acclimatization. Purbang is also Yarshagumba area. It has a very big area of meadow. In summer, the shepherds take their sheep to graze in this area. From here we can have a magnificent view of the high Himalayas and barren lands. In March and April, the route may be totally covered with snow and trekkers may be lost. This is the borderline for Rukum and Dolpa districts. You may have the luck to see Himalayan blue sheep and big Himalayan rats. Still, our route going uphill. We walk through a pass called Jang La (4500 meters). After the pass, the route goes downhill through the barren lands. We walk through the forest just before an hour to Sahartara, a small village near Tarakot. We can visit Daisi Gompa and Samteling Lama Gompa here. 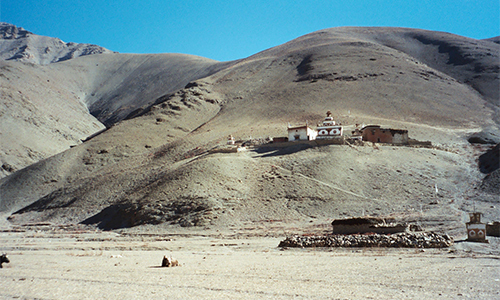 Sahartara is a Magar village that has close trade relations with the Tibetans hence they have taken the Lamaic religion. Thus we can witness in some house temples and many stupas. We have a rest day here and maybe a guest in one of their traditional houses. Today we can visit the somewhat lower Sahartara and there also visit an ancient temple just near the camp. We can visit the local people and know about their lifestyle. We can enjoy some local products here also just like in Pelma and Dhule. The local people in Sahartara are very simple and love to welcome the guest with a smile and serve their local products. Apple trees are grown here, so in the autumn, we can enjoy the local apples. The view from here is panoramic. We can just rest, have a bath or visit the places today. We can shop in the village for our trekking. Himalayan Vacation Treks and Expedition leader will arrange for our visit to the various nearby places today. In the beginning, we walk downhill to the village of Tarakot. We cross a small stream that comes from the Lama Gompa village. A wooden bridge has been made over the stream. Then we walk along the Thuli Bheri River. About half an hour later we cross the Thuli Bheri River through a suspension bridge. There is one more suspension bridge over the point where Thuli Bheri River and Tarap Khola meets. After crossing this bridge, we have lunch and head to Lahini again along the Thuli Bheri River. The path goes uphill through the jungle. We camp beside the river in Laina Odar. Odar means a cave. Nepali staff prepares dinner or do campfire in the cave. After Laina Odar we walk through the barren land along the Tarap Khola. No jungles anymore. The path goes uphill and downhill both. The campsite is again beside the river which is near the Nawarpani but it is also called Laina Odar. This is the point where the Tarap Khola and Kyakuchin Khola meet. One more cave is there. We may see blue sheep and yaks in this area. Today walk along the side of Tarap Khola in the beginning. The path goes slightly uphill and downhill. After the lunch, the path is easier to walk since it is almost flat with slightly uphill. Let’s say we are slowly rising to over 4000 meters, but also the valley is so narrow that the sun, especially in the autumn is seen for a few hours a day. Hence the weather is cold in this area. A number of chyorten, stupas is seen on the way. We slowly head to Dho Tarap, a group of real Tibetan villages. A whitewashed Tibetan Buddhist gompa shines among the village. We are here in a totally different world. Since it is very cold here, the villagers don’t prefer to take bath often. 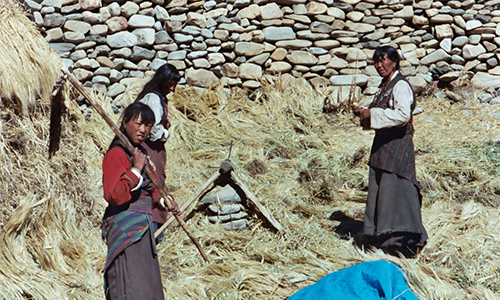 The villagers go to the market at the Tibetan border for shopping and Yak is used to carry loads. We have a rest day here as acclimatization. Let’s meet the local people in Dho Tarap today. We learn a totally new way of life here. 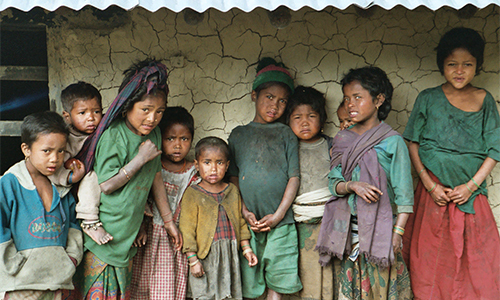 The people wear very thick clothes called Bakkhu and shoes called Docha. You can compare the costumes of Dho Tarap people with the costumes of Tibetan. They prepare the shoes themselves using coarse wool and yak leather. 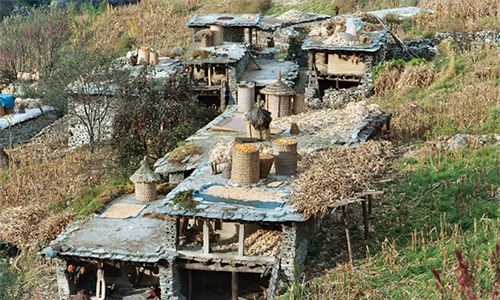 Their houses are sturdily built with thick walls of stones and decorated with prayer flags. Barley is the staple food crop grown in the fields. Potato is another root crop grown over here. They have yaks, horse, mules, and sheep as their domestic animals. They have trade with Tibet. We can go to visit gompa. The view we see round Dho Tarap is the barren lands everywhere since this area falls in the range of Tibetan plateau. We carry pack lunch today and walk at ease for three and half hours to Thaksi at the foot of the Numa La. On the way we cross Ghakar village, Chrystal Mountain School, Kakar village, Kakar Gompa, Chhumagaon, Rimpoche Gompa, Modo village, Modo Gompa. We take our time to visit the gompas in the delightful villages where we walk through to get to us. We camp at a spot about a half hour walk from the last village of Modo at Thaksi. It will be a really cold night. We can view the beautiful barren landscapes from here. Blue sheep can be seen from here. Today we walk one or one and a half hour earlier than the other days because the weather may go worse all of sudden. We are fresh and acclimatized well for the highest pass Numa La (south), that we are going to cross today. We carry our pack lunch. In the beginning, the path goes slightly uphill along a stream, Numala Khola. Then we cross Numa La BC. After this, the path goes uphill. Then we cross Numa La (South) pass. From the top, we can see clearly the outline of Dhaulagiri, Annapurna, and Manaslu. Also, we can see in the north rows of the endless barren mountain ranges that go to the Tibetan plateau in the distance. Then we walk downhill to the stream called Gyambo Khola. We walk along the Gyambo Khola. In some places, we cross wooden bridges. Finally, we reach Baga La base camp beside a stream called Chakbari Khola. Today also we start one or one and a half hour earlier than the other days because sometimes the weather may go worse all of a sudden. We walk for about 3 hours uphill in the beginning. We carry our pack lunch which we eat somewhere on the way. Soup or tea will be served by the staffs on the way seeing the condition so that you feel fresh and will gain the energy soon for walking. We are going to cross a pass called Baga La today. From the top of the Pass, the view of the Phoksundo valley is spectacular. We can view the most beautiful lake in Nepal, Phoksundo. We camp on the beach of Phoksundo and watch the settlement of monks and extremely beautiful blue of the lake. The water in the lake is highly cold. Hence, we cannot swim or wash our clothes in the lake. Today we rest in the Phoksundo camp, not for the acclimatization but to relax since we are extremely exhausted from the trekking in the past days. And of course, to enjoy the lake and visit the nearby beautiful village called Ringmo gaon (Phoksundo). We can visit the beautiful gompa situated on the beach of Phokundo. It is also possible we go across the lake to take a beautiful walk up. From the camp, we can see the path up well. Let’s go upstairs to have a splendid view of the lake and surrounding of beautiful mountains. After many days, we can enjoy the view of the jungle here. We can have a friendly talk with the local residents and can have the taste of local products like local wine, alcohol, Phapar dhindo. In the campsite, there is an office (check post) of Shey Phoksundo National Park. So the permit cars are checked here. Himalayan Vacation Treks and Expedition guide will arrange for our visit to the various places today, especially to Gompa and lakeside. We can visit the village on our own. We start walking downhill along the stream Phoksundo Khola in the beginning. Then the path goes uphill. We view a large waterfall made by the water from Phoksundo Khola on the way. Then we walk downhill. We visit a mountain museum on the way. We along with the Phoksundo Khola heading Chhepka. Today we walk downhill along the stream, Phoksundo Khola towards Dunai. Dunai is the headquarter of Dolpo. Hence, Dunai has internet and other facilities. We can call our family and friends after long days. We have lunch at the camp. We are gearing up for the final day to Juphal. We walk along the Thuli Bheri River today almost for the whole day. Just before we reach Juphal we walk uphill for about one and a half hours. Juphal is the village with air service. Juphal is also the village with internet and other facilities like Dunai. You can have the taste of Apples and wall nuts which are famous over here. We rest here today and get ready to fly to Nepalgunj tomorrow morning. Today we fly from Juphal to Nepalgunj and then to Kathmandu on the same day. OR from Nepalgunj, we may catch a bus to Kathmandu too. The flight from Juphal to Nepalgunj takes 45 minutes only. And Nepalgunj to Kathmandu flight takes 40 minutes. But flight has no certainty due to the special climatic reason: sometimes windy, sometimes cloudy etc. Flight cancellation and delay is the common phenomenon in this point. So, we may have to pay extra charge USD 250-350 for the plane charter so that we will not miss our flight to our home country from Kathmandu. But the extra charge depends on the number of pax in the group. If it is a small group, then the price will be higher. The flight route also may be changed. We may fly to Pokhara or Kathmandu from Juphal instead of Nepalgunj. When we get off the plane in Nepalgunj, suddenly we feel very hot since we were in the high alpine climate for several days. So we suddenly need to put off our warm clothes and shoes and socks we had been wearing for several days. We feel again, we came to the new world after having walking in the silent, barren lands for several days where there is no crowd, no rush, no noise of city life etc. Moderate temperatures, clear sky with outstanding views, making it a great time to do any of our treks. Occasional short storms may dump snow at high altitudes. This is the season of feast and festivals. This is also known as the special season for flowers in Nepal. Marigold is popular and found best in this season. Temples and holy places are visited during this period. Festivals like Dashain, Tihar, and Chhath are celebrated during this season. Long national holidays are offered for this festival for workers. This season is known as the king of the season. No rainfall, sunny days and moderate temperature are the most favorable factors of this season for treks and tours in Nepal. Every kind of treks and tours can be done during this period. So many tourists come to see beautiful Nepal in this season. Many trekking routes are full of tourist during this season. Peaks 6000m to 7000m is the best destination for climbing in this season. Himalayan Vacation Treks and Expedition welcomes tourist to feel the splendid view of nature of Nepal in this season.